NYC flood was foreseen: Now what? 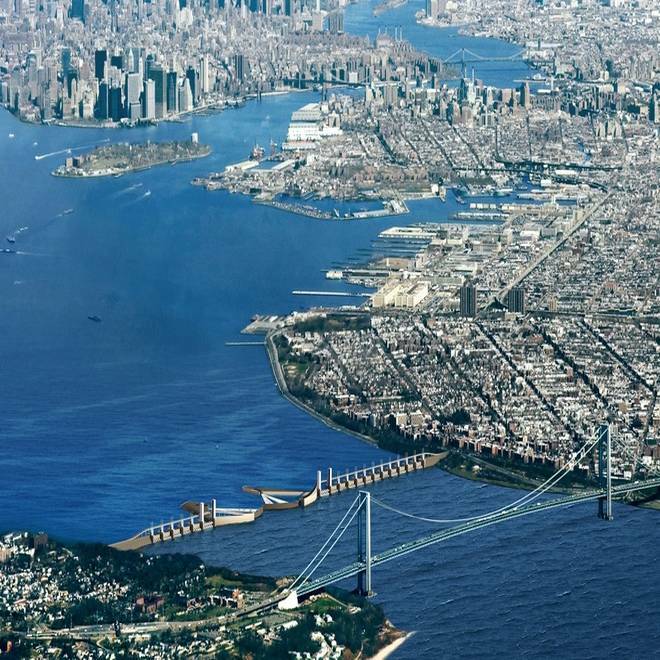 An artist's conception from the Dutch engineering firm Arcadis illustrates its proposal to build a barrier in the Verrazano Narrows between New York's Brooklyn borough and Staten Island, shielding the Upper New York Bay. This barrier would be supplemented by two smaller barriers, one between Staten Island and New Jersey and the other on the East River. Experts say the vast destruction wreaked by the storm surge in New York could have been prevented with a sea barrier of the type that protects major cities in Europe. Marine scientist Malcolm Bowman has been warning since before Hurricane Katrina that the New York metro area was susceptible to a catastrophic storm surge, but the fact that superstorm Sandy proved him right doesn't make him feel any better. "It was all predictable, and unfortunately it all happened,” Bowman told me today. "But then it got worse." Bowman's nightmare scenario, laid out in a 2005 report, foresaw a 12-foot storm surge that devastated low-lying neighborhoods in the New York metro area. When Hurricane Sandy was approaching landfall on the New Jersey coastline on Monday, the National Hurricane Center predicted that the storm surge could amount to somewhere between 6 and 11 feet. The tide that pushed into New York's Battery Park was higher than any of those figures: 13.7 feet in height. The results were catastrophic: Subway and highway tunnels between Manhattan and Brooklyn were flooded. Power stations were swamped, leaving millions of people without electricity. The water washed over runways, rail yards and roads, disrupting traffic for days. Whole towns were submerged in New Jersey. Rising water levels affected operations at half a dozen nuclear power plants in the region. The estimated toll: At least 46 deaths in the United States, and an estimated $20 billion or more in property damage. "This has been a knockout punch," Bowman said. "This is a wakeup call." A 14-foot storm surge rushed into lower Manhattan, shorting out the ConEd power station and destroying cars and homes. NBC's Anne Thompson reports. Storm surges have hit the region before — most notably with the deadly nor'easter of December 1992, and to a lesser extent with Hurricane Irene last year. But Sandy was much deadlier. "What happened on Monday night is that the maximum surge occurred at high tide, and it also happened to be a full moon," Bowman said. "All those events came to coincide, and that's what made it so bad. If the storm had hit six hours later, it would have been low tide, and there would have been less damage. Timing is everything." But in Bowman's view, it's not just a question of bad luck. "Climate change is real," he said. "We've had these two extreme events, two years in a row. It's time to think about levees. This is what the Europeans have done." Bowman and his colleagues at the Stony Brook Storm Surge Research Group have been calling for the construction of a network of levees and gates that could block the gargantuan push of water that accompanies superstorms like Sandy. The project would start with two or three storm surge barriers, modeled after the systems that have been built on the Thames River in England, or on waterways in the Netherlands. Bowman said three such systems are already protecting Stamford, Conn.; New Bedford, Mass. ; and Providence, R.I. The best locations for the New York region's first barriers would be at the Outer Barrier and across the Upper East River, Bowman said. "They would cost in the range of $5 billion or $10 billion each," he said. "That sounds like a lot of money, but you wait until you hear what it will cost to bring the city back." Watch a lecture by Stony Brook University's Malcolm Bowman on tsunami hazards and storm surges. Up to now, New York's response to flood threats has been to build smaller-scale barriers around facilities to make them more resilient to flooding. A multibillion-dollar project to create a storm surge defense system hasn't been on the agenda. "The city has been very polite, and they agree that in the long term it will become a necessity," Bowman said. "But for now they say, not yet. They're focusing on resilience, solutions to small problems." That strategy will almost certainly change in the post-Sandy era. During a Tuesday news conference, New York Gov. Andrew Cuomo acknowledged that it's time to upgrade the city's infrastructure for the superstorms to come. "Going forward we are going to have to anticipate these types of extreme weather patterns," CNBC quoted him as saying. "And we have to think about how we redesign the system so that this doesn't happen again." "What has to happen is, either Congress or the city of New York needs to put in a request to the U.S. Army Corps of Engineers and say we need to do a feasibility study," Bowman said. "We've done it on the academic level, but now we need to bring in the corps. ... We could be studying this for the next 10 years, but we better get on with it."